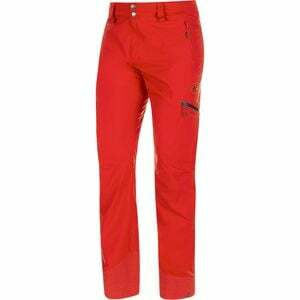 Whether you're scoping lines deep in the backcountry or searching for the resort's hidden gems, the Mammut Stoney HS Pant will give you all the mobility and comfort you need to find and shred the season's best turns. Thanks to the Mammut DRYTechnology material, you'll have lots of comfortable stretch on the slopes, as well as dependable waterproofing and breathability for days when you're floating through waist deep snow. Subtle inner thigh vents release heat and let in cool air when you're hiking to higher lines or just working up a sweat bouncing through trees and over drops. Down by the ankles you have boot gaiters to keep deep snow from flying in, and Cordura reinforcements at the cuffs to resist abrasion from sharp ski edges and crampons. Speaking of crampons, this pant has easy adjustability of the leg width, so you can rock a slimmer fit and not have to worry about accidental tearing from your crampon edges. The waist is also adjustable, and has loops for attaching suspender straps or connecting to a compatible ski jacket so you can give yourself added coverage in truly deep conditions. Rounding it out are hand and thigh pockets to hold any trail maps or small pieces of gear you need to bring along.